I had not been blogging much about food in Japan because thee are just too many good food to cover and most of them are pastries. Here is one of my favourites in Japan, La Vie Douce, whose cakes are not only available at its main stores in Shinjuku and Yokohama, but also at the basement 2 of Takashimaya Shinjuku. The price range for the cakes are affordable and the taste and texture are well-balanced. This is the shop's signature pastry and a must must try if you would like to choose one. Milk Chocolate hazelnut mousse infused with Grand Marnier, layered with bitter-sour orange confiture and an ultra-buttery and crumbly tart. The tart shell here is one of the best I have tried so far. Chocolate Mousse cake made with KAOKA's Organic Chocolate and pistachio filling. In the center, there is also the sour red fruit compote which is not reflected in the picture. This is the signature Cheesecake of La Vie Douce that is made with cream cheese and fruits gelee. A very light and pleasant cheesecake. Sakura Melange, with sakura syrup and strawberry gelee, custard cream topped with sakura white bean paste. This was offered during the Sakura season, and is one of the better sakura cakes that I have tried. A spring twist to the classic mont blanc and the meringue at the base was baked till crunchy. Of course there was also the choux creme puff with really rich vanilla custard filling. However, the choux skin did not left a deep impression. This was also limited only for a few weeks. The chef made a Japanese style version of the classic French Chocolate Gateau and topped with chantily creme & matcha shortbread. Very dense texture since the base recipe is supposed to be like that. Good with a cuppa of matcha. This was one of the interesting ones as it is like a cross-match of flavours. Offered along with some special festival, it is a lemon mousse with milk chocolate center on the left and dark chocolate mousse with yuzu creme on the right. There were also crunchy chocolate pearls and a crispy biscuit base. Strawberry mousse with cream cheese on top of a galette base. A weird name but it is a French word that refers to the boyish fashion trend since the 1920s. This style implies independent young women with short hair and a simple sharp silhouette. Not sure how it inspires the creation of this mango gateau though. The photos here are not taken with a proper camera and thus their appearances might not looked as good as they taste. What is attractive of the creations here is that they have a balance of textures with surprising elements that showcased the innovation of the chef. Though it has only been opened since 2001, this shop could be one of the rising stars in future. 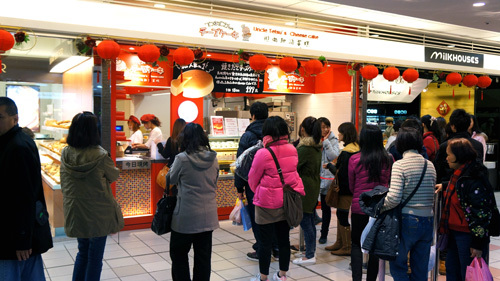 If you walk past the Taipei Main station, there is always this stall that would attract a long queue all day. 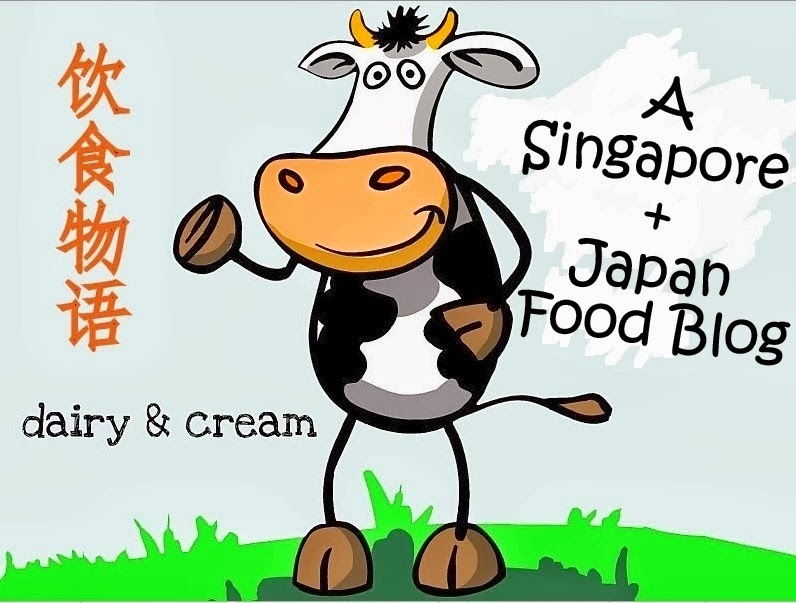 The secret behind this lies in it's premium ingredients cheese and eggs that are sourced from Hokkaido and Miyagi. This formula produces a soft and very light cheesecake that resembles a sponge cake. Each 6-inch cake cos NT199. In Taipei, one person is strictly allowed to only purchase one as the oven only produces 12 whole cakes each time.So the question is : is it really that good and worth the waiting time? Well, the texture is faultless especially for those who prefer this kind of souffle cheesecake to the denser New York style cheesecake. However, the taste of cheese is lacking and there is no aroma of vanilla, eggs or cheese. Moreover, it is relatively drier than the similar souffle cheesecakes here like ichiban or breadtalk. Hence, the great hooha in Taipei over this Tetsu cheesecake might just simply be overhyped. Perhaps the original version in Kyushu might be softer and more moist but that will only be known when I get to try one in future. That said, if you are willing to spend hours queuing for this no-fuss cheesecake, be prepared to go early even before it opens at 10am. Ajinomori? Does it mean the Taste of Forest? Or a Forest of Tastes? The settings of the restaurant give diners a warm forest feel while the menu has a wide selection of both traditional and creative Japanese cuisine. But according to the website, it means a "forest-ful flavors for the palette". Ajinomori brands itself as an izakaya but it seems more like a casual family dining place. These were very fresh and should satisfy any sashimi lovers. But if you have a bigger appetite, go for the 7 kinds. For those who might be looking for raw oysters, unfortunately this is the only oyster dish. Paired with mustard sauce, they certainly go well with another mug of beer. An average decent plate of sushi that is non spicy and suitable for kids who cannot take sashimi or spicy sauce. This left a deep impression because the thick kimchi stock here is actually more intense and flavorful than some Korean restaurants. The rich claypot of onions, cabbage, mushrooms and thinly sliced shabu shabu pork gives the soup a natural sweetness. Oh, and don't forget to break and mix the egg yolk before you dig in! The healthy tofu does not help to reduce the sinfulness of the creamy cheesy sauce but it is definitely worth the calories for cheese gratin lovers. The Mentaiko cheese sauce is not too overpowering and the dish surprised us with the long sticky strands of mozarella cheese like those in a hot pizza as you lift the tofu away from the dish. But the tofu is just literally lying comfortably in a bed of gooey cheese. For a crunchy texture, this crispy salmon skin with spicy Mentaiko sauce is the way to go. Before you know it, these deep fried snacks will be gone in seconds. But do not expect extreme spicy sauce as the version here is very mild. This does not looked spicy nor tasted spicy. However, it was my favorite dish of the night because the size of the scallop meat is one of the bigger and fresher ones I've had locally. Just swoon and slurp it up with the blend of cheese sauce and cod roe. The sesame pudding here is highly recommended especially for adults as the taste is not sweet at all and has a nice aroma of sesame nuts. This is in fact one of the better and value for $$ desserts so far. Chocolate Millecrepe cake that seems to be offered for a limited time as it is not on menu. This place actually offers much more interesting looking dishes such as omelette in pink gravy of Mentaiko and grilled unagi in light grey-colored mustard sauce. Looks weird on the menu but they certainly stirred my curiosity. Desserts are recommended if you still have space. I am not experienced enough to give comments on savoury food even though most posts here are about them. However, when it comes to sweet food such as pastries, cakes or desserts, I can talk non-stop about them. Having tried and is still trying the pastries in Tokyo and in Singapore, I personally still believe that the variety and quality of those here still cannot match those in Tokyo. The local patisserie market has seen an exponential growth of specialty cake shops in recent years but still, there is still potential for more. Even though there are already good reliable Japanese brands such as Kki, Flor, Patisserie Glace or Tampopo Deli, I am still in search of a shop that can match those in Tokyo.Their cakes are undeniably tasty but is still towards the safe side. N years ago even way before I went overseas, I tasted almost every single cake from TWG Salon when it first started in Republic Plaza. Back then, it was the one and only outlet. I would say "almost" because I would record every variety of cake that I have tried there by drawing them in my notebook. There is always something new and unexpected whenever I drop by and I've bought the cakes so many times that the staff there could remember my face. It may sound odd but I try to avoid trying the same slice of cake twice (that happens when I thought I haven't tried it but realised later that I did try before). After I returned, I eagerly tried out the cakes from the new openings like Tiong Bahru Bakery, Dean & Deluca, etc....in search of the right one but then soon I find myself stepping into TWG again. The patisseries at TWG there rarely disappoint and I would dare say that it is the only place in Singapore that matches those in Paris or Japan. ( I was surprised when I walked past one branch in Jiyugaoka). The Republic Plaza outlet no longer display their cakes on the outside but fortunately they can still be found in Ion and MBS. I do agree that Canele and Antoinette are strong contenders but more seasonal offerings/changes might be good. The pictures here are those which I have tried after returning home but I believe the list will continue with the chef's ambitious experimenting mindset. This could be a Thai-inspired fusion pastry. The pandan custard is not too sweet but forms a very rich and thick texture of rice pudding. While this contains chestnut mousse, it is not overly sweetened like a Mont Blanc. I prefer this to the matcha millefeuille (at the top) as the puff pastry of the matcha version was not crispy enough but the custard of both version was rich but not too creamy. Most of the pastries at TWG are mousse cakes besides tarts. What impresses me is that the texture of the mousse is always just right while the sponge remains moist (perhaps some have been soaked in liquids). Fruit compotes of different berries ( raspberry/blueberry/cassis) are usually very sour which curbs the creaminess from other components. The tart shell has remained consistently crispy. While I can't say that every single piece I've tried is 100% perfect, I appreciate the chef's efforts to keep on inventing, playing with the flavours, textures and presentation. It is hard to spot a classic pastry here (perhaps the millefeuille or the signature chocolate fondant) but it is still possible to find new flavours in their classic pastries. Apart from their Singapore Surprise Tart which has always been regularly sold in the outlets, I highly recommend pastries lovers to try their pastries. The high price might be a factor but I believe the quality is competent. Nonetheless, I doubt what I put here will be available since the selection keeps changing. Amazed by the rapid expansion of this Singapore tea brand in Singapore and overseas in such a short period of time, it will be interesting to see what new exciting flavours TWG will offer in future. Korean BossBarBq: Chicken Wings in Gangnam Style?